The stones in Laura Jackson's ring have a mystical beauty. An ancient legend says the Peruvian opal is powerful enough to release its wearer's stress and improve their confidence. We’re not experts on Inca folklore but one thing is for sure: The stones in Laura Jackson's jewelry have a mystical beauty. 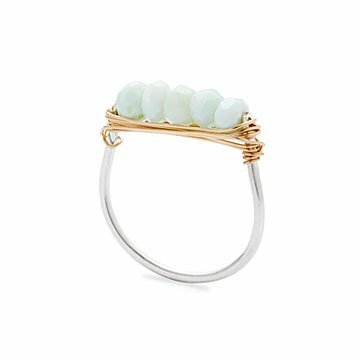 Starting with pebble-sized Peruvian opals, Laura hand-strings the beads using 14k gold fill wire around a shimmering sterling silver band for an artful addition to your look. Handmade in Pennsylvania. Make it a set! Click here to see the matching Peruvian Opal Hoop Necklace and Peruvian Opal Hoop Earrings . Laura Jackson creates modern yet timeless jewelry for the fashion-conscious woman. Her jewelry utilizes genuine materials: real stones, precious metals, and nothing pre-fab. Her jewelry is all hand-wrought from conception of design to production, including creating the shapes for designs, soldering, polishing, hammering with different textures, and connecting stones with wire wrapping. She uses sterling silver, 14K gold-fill, and semi-precious gemstones. All of her creations are handcrafted in her Philadelphia studio. Click here to view Ring & Belt Sizing Chart. I got the whole set, plus a diffuser bracelet with similarly colored stones for my wife. I surprised her with one piece at Christmas, one at our anniversary in January, and one for Valentine's Day. The pieces are pretty, delicate, and unique. The stones varied in the ring and earrings much more than represented in these pictures, with some grey, mint and more muted aqua tones. My wife actually prefers this - she likes the more natural and varied look. Unfortunately, the necklace does not look like it matches the set since the stones in the one we received were all one color and a very definite bright aqua. I will be returning it as it is not as pictured. Looks much smaller in person and the stone color is not uniformal. One of the stones was dark grey. Eye sore.